After months of searching, Kim and I finally purchased a motorhome that seemed almost ideal for our needs: a 29-foot 2005 Bigfoot 30MH29SL. On a rainy Saturday morning in mid-January, we drove to the previous owner’s house to take delivery. “No worries,” I said. “We’ll get it fixed as soon as possible.” I’d mentally prepared myself that leak would be an issue to be addressed before we started our cross-country trip. Sure, I felt some panic as I watched the water stain spread, but I also knew there was nothing that could be done at this point. No use freaking out. At home, we quickly covered the RV to protect it from the heavy rain. (RV covers are curious things, by the way. Imagine a cover for your barbecue grill. Well, an RV cover is almost exactly the same thing — only much, much larger.) Then we fired up the generator and got to work. First up, we cleaned the Bigfoot from top to bottom. We scrubbed the fixtures, and we vacuumed and shampooed the carpets and upholstery. Finally, we spent some time familiarizing ourselves with the systems. We opened and closed the slide-out. We turned on the generator. We opened cupboards and poked buttons and read manuals. It was like playing with a great big toy. “What are we going to do about the leak,” Kim asked. “I’ll call All RV,” I said. “They inspected two RVs for free, and I want to give them our business.” I left a message describing our problem and asking for a call back. We waited. And waited. And waited. On Monday morning, I called back and left another message. “We need to get the leak fixed,” I said, “and today’s the only day we can get down there.” When we hadn’t heard back by noon, we had to try a different route. We googled for another RV repair place and found one nearby. 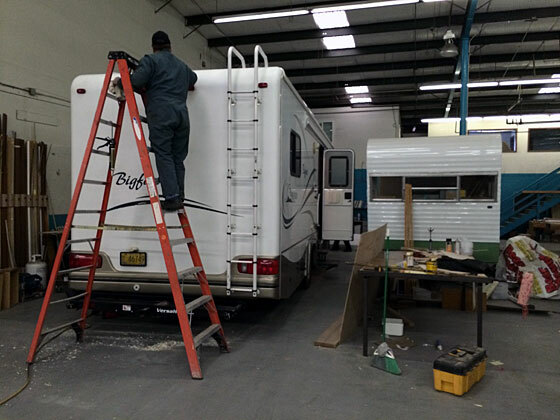 “Bring your rig over and we’ll take a look at it,” the woman at Rose City RV told us. Within half an hour, the owner was climbing on the roof. “How soon will it be ready?” I asked. “By Valentine’s Day,” he told me.